FIRST look of Amitabh-Taapsee starrer out now; TRAILER out tomorrow! 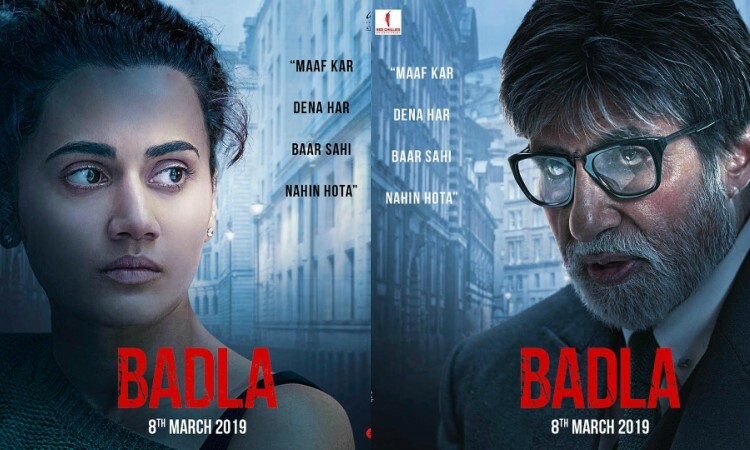 The makers of Badla have given the world a glimpse of their upcoming crime thriller by launching their character posters. The looks were unveiled through an intriguing digital banter between Shah Rukh Khan, the leading star cast and the director of the film. The conversation was initiated by Shah Rukh Khan that received an interesting response by Mr. Amitabh Bachchan. It further prompted Taapsee Pannu to launch the first look of Mr. Bachchan's character in the movie. He then responded to this by launching her first look in the movie. The director and Shah Rukh Khan then joined the conversation and left the audience on a curious note. Badla lena har baar sahi nahi hota, lekin maaf kar dena bhi har baar sahi nahi hota. Khushi to make her B'wood DEBUT, Wants THIS Biggie to be her Mentor Amitabh-Shah Rukh's twitter Banter in FULL-SWING ahead of 'Badla'!